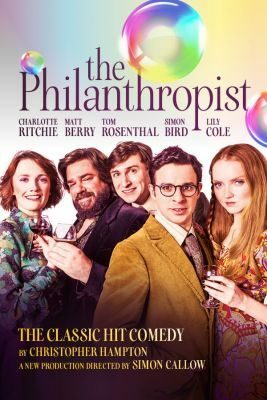 Last summer Channel 4’s Friday Night Dinner actors Simon Bird and Tom Rosenthal reunited on the West End stage in the cast of The Philanthropist for the Simon Callow directed ‘bourgeois comedy’. Completing the line-up of the five main characters were Fresh Meat & Call the Midwife star Charlotte Ritchie, Toast of London‘s Matt Berry and model-turned-actress Lily Cole. Ticket and hotel packages for The Philanthropist Theatre Breaks sold out with favourite hotels including the Radisson Edwardian Leicester Square, the 3 star St Giles Hotel and The 4 star Strand Palace Hotel .